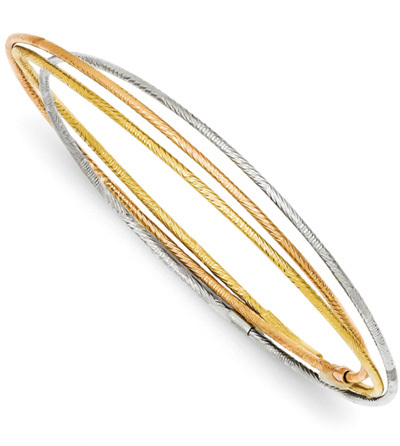 A set of three 14k gold tri-color intertwining bangle bracelets. Not one, not two, but three metals are featured in these versatile go-anywhere bangles. This trio of rope-like bracelets features three colors of 14K gold: sunny yellow gold, cool white gold and warm rose gold, each contrasting with the others to form a set that you'll want to wear over and over, from the work week to the weekend. These light 7-inch bangles can be worn with jewelry of any color and will complement any outfit, whether dressed-up or casual. For a petite woman, wrist size 7 or smaller. We guarantee our Set of 3 Tri-Color Gold Intertwining Bangle Bracelets to be high quality, authentic jewelry, as described above.